Kiki and Oz are regular visitors. Oz is growing up rapidly. I incorrectly said in my last entry that Oz had stopped back-riding. It turns out that he still occasionally gets on Kiki's back, although he's getting bit heavy for this. Although Oz generally sticks close to Kiki, sometimes he's seen on his own and on two occasions he slept by himself in Box 7. He has also been bold enough to come into the house and bite me on the toe. 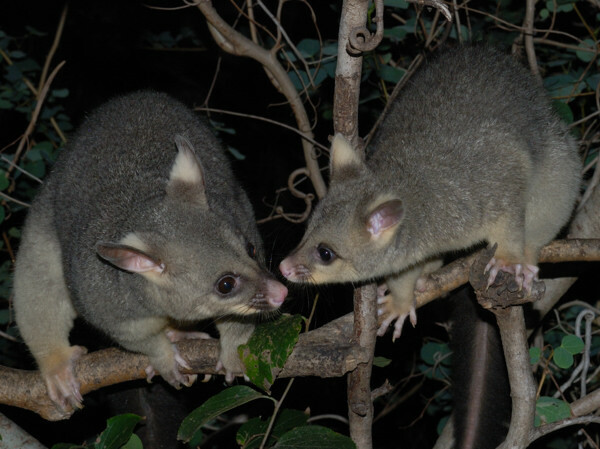 The possum with the white-tipped tail mentioned last time as been seen around the place frequently, but always runs off when a human approaches. 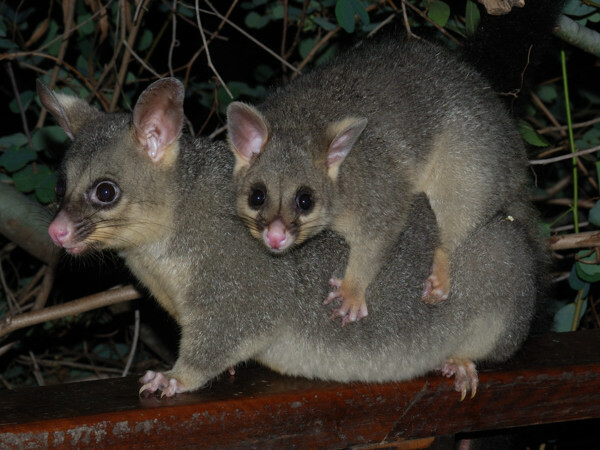 Usually all that is seen of the possum is the white tip of the tail disappearing rapidly into the distance. Here is the best photo I have of this possum. I'm still not sure whether this possum is Flea. The end of the tail is really distinctive and looks exactly like Flea's. 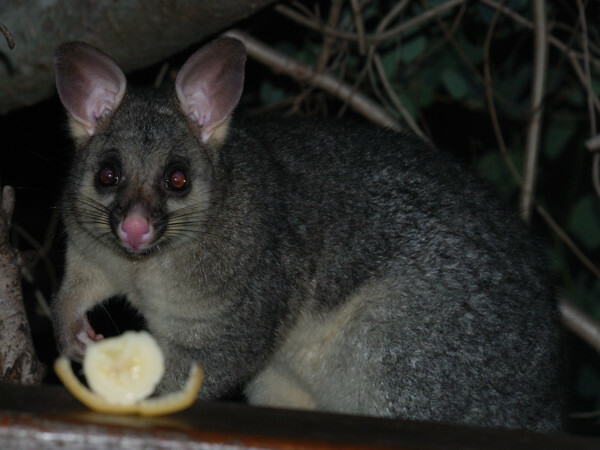 Also, the face looks very much like Flea's, but on the other hand this possum is much more scared of humans than you'd expect for a possum who grew up here. Scruffles might still be around. A rat acting a lot like him was seen near the balcony hand-rail a couple of times recently. Dexter has been seen a few more times, but still doesn't want to approach the humans. Wasabi has been back several times, and was his usual happy, hungry self. His tail injury has improved further. 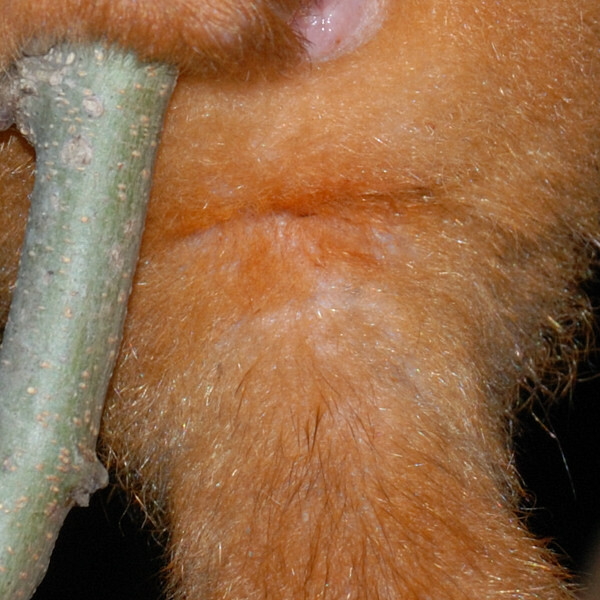 The fur is growing back thickly and the site of injury is now barely visible. Just wanted to say thank you too, re the temp gauges in each box, they are interesting to check out. There's been no sign of Amiri since he was last seen 6 weeks ago, so it looks like he's moved out for good. We can only hope for the best; he was a very smart and capable possum and was taught well by Kiki, so he's probably got a better chance than most.